The Châteaux, one of the best preserved medieval Châteaux in France,with its working drawbridge and barbican being just one of its remarkable features, it has 8 massive towers,linked by ramparts and a crenellated curtain wall The Châteaux is a prime example of 14th and 15th century architecture, an existing Châteaux was dismantled around 1422 after being badly damaged in the 100 years war, construction of the present Châteaux began about 1456-1458. The barbican was added around 1497. The Châteaux is still in remarkable condition The Châteaux remains in private ownership, it is a listed historic monument,and is still lived in and opens to the public at certain times. 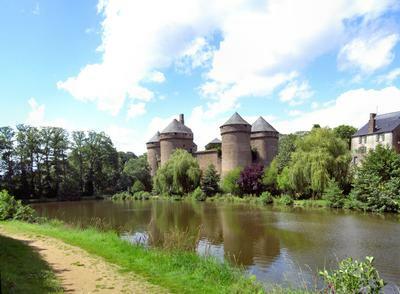 Opposite the Chateaux there is an old salt loft and what was the prison, a walk round the lake you will find the ancient Lavoir, the wash house, there is also the medieval garden, formed on the former Benedictine convent grounds, with herb garden, fruits and vegetables. Across the road down through the car park is the very nice rose garden, with over 300 variety's of roses. There are two other châteaux at Lassay; the Château de Bois-Thibault is probably the more interesting, the third Château Bois-Frouis little more than a few stones and a gateway.